Residential low voltage outdoor landscape lighting, as shown in Figure 1, has grown by leaps and bounds over the last decade. The variety of light fixtures and lighting accessories has grown exponentially. 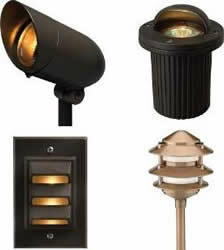 You can even purchase low voltage light fixtures that replace pavers in driveways, walkways, patios and pool decks. Low voltage outdoor landscape lighting is relatively safe and easy to install. However, there are some differences between installing low voltage outdoor lighting systems and installing light fixtures in your home. Many home handymen are quite competent when it comes to installing a new or extra electrical outlet (receptacle) or group of light fixtures in their homes. When running wire for an electrical outlet (receptacle) or light fixture we know that 14 gauge copper wire is used for 15 amp circuits and 12 gauge copper wire is used for 20 amp circuits. We never have to concern ourselves with the length of the wire that we are running from point A to point B. However, when it comes to outdoor low voltage lighting the considerations are substantially different then when running 120 VAC in your home. In a 12 VAC circuit the voltage drop from the low voltage lighting transformer, that is converting or stepping down the 120 VAC to 12 VAC to the light fixtures can have a major impact on the quality and level of light that you and your guests will see. This is because the voltage drop, due to the resistance of the wire, has a very minor impact on the output of a light at a light fixture on a 120VAC circuit while the voltage drop at 12 VAC makes a substantial difference to the light output. Voltage drop is relative to the gauge and length of wire. The smaller the diameter of the wire the more the voltage drop is over a specific length. The longer the wire the more the voltage will drop over a specific length. Note: Wire gauges are specified in reverse. The larger the number the smaller the diameter of the wire; 10 gauge wire has a larger diameter than 12 gauge wire which has a larger diameter than 14 gauge wire, as shown in Figure 2. Table 1 provides an indication of the difference in light levels, relative to the wire gauge and distance, that the wires from the low voltage or step down transformer to the light fixtures are run. Wattage numbers in green are considered acceptable at least 50% of the wattage of the lamps is available, while the wattage numbers in red are considered unacceptable as they are below the 50% wattage threshold. Note: One of the most common mistakes made is in calculating the length of the wire between the transformer and the first and subsequent low voltage light fixtures. The length of wire is not measured as the crow flies! It includes the distance from the ground to the transformer and the actual length of the wire. In many cases you will be surprised if you actually measure the wire length rather than guesstimating it.